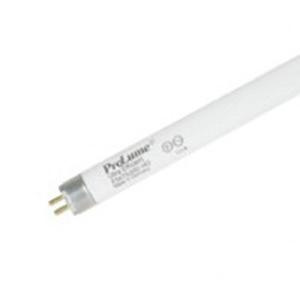 Halco Lighting ProLume® Eco-Shield® High output 39-Watt T5 miniature 2-Pin base linear fluorescent lamp offers 3500 initial Lumens and 3320 mean Lumens for bright and crisp light output. This lamp has programmed type ballast that regulates the current flow. It has color rendering index of 86. Lamp with 3500K color temperature rating radiates natural white light to the surrounding. Lamp in phosphor coated finish, measures 34-Inch x 0.63-Inch Dia. Lamp has average life of 24000 hours. It is ideal for cove lighting, display lighting, residential and commercial applications. Lamp is RoHS and TCLP compliant.